Machine shops specialize in different industries and different sized components. The range of equipment used in machine shops is wide in scope. 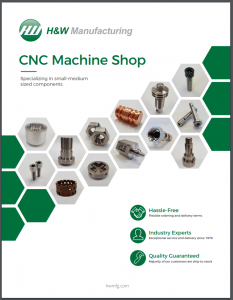 Choosing a machine shop with experience in your sized product and with your types of materials is essential to achieving the right quality product. It’s also important to evaluate their accompanying turn-key services to ensure they can accomplish everything you need. Honest and upfront communication is important. There are machine shops that will say they can get something done in a certain amount of time to win the project and then push their timeline. Ask questions about their workload and understand their timeline and flexibility. Make sure you have ways to hold them accountable to the timelines and budgets that they promise at the beginning. Working with a company that is established, has exceptional quality control processes and has earned the trust of customers for many years, is a good way to ensure quality. But, it’s also important for shops to stay up-to-date on technology and equipment. Learn about the history of the company and consider taking a tour to learn about the facility. Ask about their long-term improvements and how they stay current with industry trends and evolutions. At the end of the day, product quality is what machining is all about. It’s important to understand the quality control measures a machine shop has in place. Understanding the process and the supply chain will help you make sure that the shop can provide your products to specs everytime, all the time. When you are up against tight deadlines and are working on production that is critical to your business, you need a company that you can get a response from quickly. While digital communication is essential, being able to pick-up the phone and get an immediate answer and response is often what’s needed to get a job done. Make sure the company you are working with is responsive and, even better, proactive about communicating the status of your order. Please contact us if we can help you on your search to find the best machine shop for your business.